Severus Snape can be a nasty piece of work, can’t he? He happens to be my favorite character in the Harry Potter series, but I admit much of my affection for him may be down to Alan Rickman’s portrayal. As J. K. Rowling herself has said of Snape, he’s not a nice guy. My daughter Maggie and I are reading Harry Potter and the Prisoner of Azkaban, and we just finished the chapter in which Snape finds the Marauders’ Map and is subsequently insulted by it. Each time I re-read this series, I pick up on nuances I missed before. This time, I noticed Snape seems to know exactly who Messrs. Moony, Padfoot, Wormtail, and Prongs are, though Lupin plays dumb as though he assumes Snape couldn’t have known the nicknames he and his friends used in school. Lupin also seems to be using Occlumency on Snape—Harry notices Lupin’s face goes blank and guesses he must be doing some “quick thinking.” Of course, none of this is exactly the point of my post. With all the hubub surrounding the release of the final Harry Potter movie, and Snape’s vindication (as well as Alan Rickman’s performance) making news for those who hadn’t read the final book, I thought it might be interesting to examine his skills as a teacher. Most people will read the title and wonder how it’s even in question. 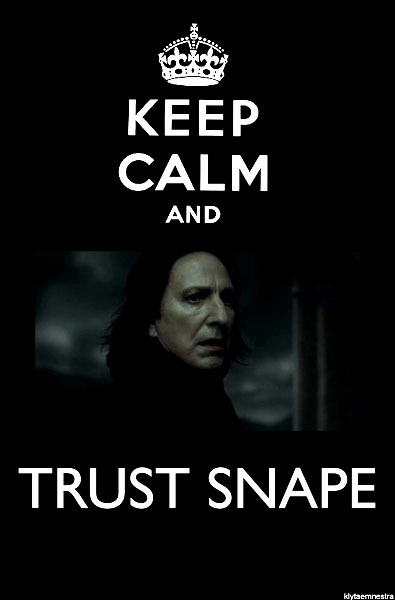 After all, Snape is sarcastic and bullies students who are afraid of him (Neville). He is disrespectful to his colleagues (Lupin) in front of their students. He favors students in his own house, Slytherin. He takes away points and gives detentions, sometimes for hardly any reason. Is there anything good about him? As we learn in Harry Potter and the Deathly Hallows, Snape has been protecting Harry out of love for Harry’s mother, and he has taken on the seriously dangerous role of double agent in defiance of the most dangerous dark wizard in recent memory. But what about his teaching? Does he do anything right? Harry inherits Snape’s old Potions text in Harry Potter and the Half-Blood Prince. It quickly becomes clear that the notes in the text teach Harry more than he has learned from Professor Slughorn, and he quickly becomes a star in Potions class. It occurred to me that though Harry buys a reference text for Snape’s class (1,001 Magical Herbs and Fungi), any time students are brewing potions, he puts instructions on a chalkboard rather than having students read out of a text, as Professor Slughorn does. One can assume he is sharing his recipe refinements with the class, and perhaps if he didn’t scare them so badly as they worked, they might produce the same quality work as Harry does using Snape’s text in sixth year. Dolores Umbridge questions whether he might not be challenging his students too much—she mentions the Strengthening Solution students are preparing when she observes his lesson as being inappropriate for the students. Snape is also capable of brewing immensely complex potions, such as the Wolfsbane Potion he brews for Lupin during his tenure at Hogwarts. He also is able to brew some concoction that extends Dumbledore’s life after he tangles with the Horcrux made from the Resurrection Stone/Peverell ring belonging to Marvolo Gaunt. Sirius Black reports that Snape arrived at Hogwarts knowing more curses than many seventh-year students, and it is clear from his Potions text that even as a student, he was inventing spells and curses. Hermione compares Snape’s teaching of Defense Against the Dark Arts to Harry’s teaching of the DA. She mentions they both speak about the Dark Arts with reverence for the sort of power and harm it can cause in Harry Potter and the Half-Blood Prince. Snape is the only Death Eater described as using a Patronus charm. In addition, as Snape is escaping Hogwarts after killing Dumbledore (by agreement with Dumbledore), and Harry is chasing him, Snape easily deflects all the curses Harry attempts to hit him with and leaves him with what I feel is extremely important advice: that Harry needs to work on nonverbal spells so that he will have an advantage as he gears up to face Voldemort. I don’t think Harry recognized it as such at the time—he wasn’t in any situation to take instruction from Snape at that moment—but it does become important later. In addition to attempting to teach Harry nonverbal spells, Snape also attempts to teach Harry Occlumency so that he can close his mind against Voldemort, one of the most accomplished Legilimens. Though Harry doesn’t master either nonverbal spells or Occlumency under Snape’s tutelage, he does learn the disarming spell, Expelliarmus, at the dueling club meeting run by Professors Lockhart and Snape. Harry uses this spell in Harry Potter and the Goblet of Fire when Voldemort rises again and attacks Harry in the Little Hangleton graveyard. It later becomes his signature. Later, he uses it to defeat Voldemort utterly. A spell to disarm rather than attack—I’ve always found it interesting that Snape chose to demonstrate that particular spell at the dueling club. You can say what you like about his personality, but you can’t deny he knows his subject matter—both Potions and Defense Against the Dark Arts. Knowing one’s subject matter does not necessarily make one a great teacher, however. Snape has several faults that prevent him from being a good teacher. But it could be argued that he is certainly one of Harry’s most important and effective teachers, and perhaps one of the teachers Harry learns most from. I am kind of proud to say I didn’t look up anything except whether it was 1,000 or 1,001 Magical Herbs and Fungi as I wrote this post. I have apparently read this series rather closely. I also Googled some links I share in note 4. I keep a Severus Snape action figure on my desk and have a Lego Snape keychain. I’m a big fan. I hope I didn’t annoy readers too much with this bit of Harry Potter indulgence. The chemistry teacher J. K. Rowling based Snape on died a few months ago of cancer. He had a good sense of humor about his influence on Snape. Hmm… I would actually argue that he doesn't really care for students, and I also don't think he relies on bookwork. Students always seem to be mixing potions in his class, and he hardly ever has the books out. I do think he cares about students (though in a broken way) and the bookwork part is true more in the beginning and less later on. I would have liked to see him use more inquiry. He's a broken man and perhaps too broken for teaching. While he cares, he allows the big picture to get in the way of the individual. Not only that, he fails to communicate the fact that he cares. He sacrifices a lot to look out for others (including Harry). One could say he sacrifices everything, including his life. 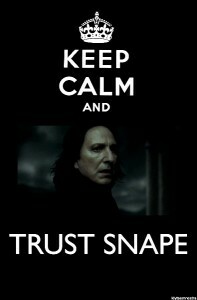 I don't think it is possible to be a good teacher if kids don't trust you, so I would have to say Snape is not a good teacher. I too love the character. Trust is an important factor to consider. He's never going to be a popular teacher, but it's interesting that Rowling still shows how students learn so much from him. I'm a graduate student at the University of Michigan in the School of Education, and my cohort was recently discussing how we should watch Order of the Phoenix in class because it is an example of educational reform gone wrong. Compared to other teachers at Hogwarts, I would say that Snape is not a horrid teacher. His techniques and strategies to get students to pay attention are just different than other teachers'. I suppose that fear is a powerful tool to get people to listen. I'd be interested to get your take on other teachers at Hogwarts (Trelawney, Lockhart, Umbridge, McGonagall, etc.). Of all the teachers in all 7 books, who is the worst and who is the best? Caitlin, try this earlier post, "Would You Send Your Kid to Hogwarts?"